feel the sacred beauty of Hawaii and wanted to go there immediately! delightful spirit and the healing messages and energies of Lomilomi. gem. May it heal millions. essence of a light and life. you to live more fully. Very highly recommended. Hazrat Inayat Khan The Heart of Sufism. I'm a lomilomi practioner for years and this book is absolut fantastic. other person's sovereignty. That sounds right to me. confines of a glorious, light way of being. You will never say "Aloha"
examples that speak to Reiki in is cases. Brian Vatcher "Kamalie o Kalani"
at every class ever since. "LEARN AND LIVE THE SACRED ART OF LOMILOMI"
When Garnette Arledge met Kahuna Harry Uhane Jim, this book was set in motion. She knew the work would be born; however, she would have to ask 3 times if the time was right…so she waited. We now are privileged to take a look into Hawaiian culture and into the healing process of Lomilomi. In a world, such as ours, it is time to bring forth the mystery and powerful traditions of Aloha. Aloha means “the breath of God is in our presence”….”A blessing in the declaration of being.” The kahunas of the past, servants of God, were put into hiding because of the missionaries that were fearful of them, outlawing healers in the 1870’s. Out of 300,000 islanders, only 60,000 survived. The power of Lomilomi continues to be practiced due to the strength and belief of those that came before. Arledge writes, Lomilomi is “the sacred shift within you that is inspired by the healing kahuna raising your vibrations and all that is around you.” Kahuna Harry does not believe one requires an intermediary, though sometimes our health issues and emotional wounds are buried so deep, a Kahuna’s work in raising the receiver’s vibration is effective and significantly relieves the receiver of much suffering. Authors Harry and Garnette speak in an interview form and many of the beliefs and customs of the Kahuna and Lomilomi are revealed. ‘The ancient ones believed that all time is now, that we are each creators of our lifestyle and its conditions. We created who we are and everything that becomes a part of our lives.” These beliefs are quite gentle in spirit and speak to the wisdom of this esoteric culture. Kahuna Harry goes on to speak about the history and path of the ancient Lomilomi customs and Kahunas. They believe that Lomilomi “empowers the God in you.” What a strong and exciting belief! There are 3 aspects to each person: Au’makua (the God self), Uhane (“a person’s emotionally mature will), and Unihipli (the unconscious). This triune can work for you. The authors describe each aspect and how they connect to help you manifest healing. In part three, the authors share the dynamics of living a life of abundance and living in the Aloha spirit. Forgiveness frees wounds to be healed and gratitude must be present for abundance to flow. At this point, Kahuna Harry shares how he came to face and accept his life’s calling to follow his Kahuna ancestors to be a Lomilomi healer. He tells of his “dark night of the soul” experience, when his grandfather died. His wounds were not healed completely and his peace was gone. This experience with depression and ultimate recovery brought him to where he needed to be to accept his life’s purpose of healing. 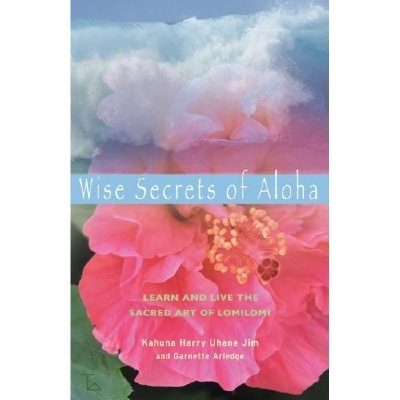 Wise Secrets of Aloha shares the stories of healing from others who were receivers of Kahuna Harry and the Lomilomi treatment. They are believers in this process and feel they are better for their sessions with Kahuna Harry Uhane Jim. He realizes he is simply a conduit of healing and that the healing is within you waiting to be found and unleashed. Lomilomi is a wonderful treatment of healing; bringing the love and peace of mind that is our natural state beyond the emotional wounds, into alignment.